Because of its pink color and long legs, a flamingo is a well-known bird to many people. People like them so much they even buy plastic ones and put them in their yards. But the flamingo, of which there are five species in the world, is a versatile bird when it comes to movement. Flamingos can walk with their long legs and partially webbed feet or stomp through the water looking for food. They can fly above the water or swim through it. They can move their long necks down into the mud and water to look for food, or stretch them all around to look for danger. 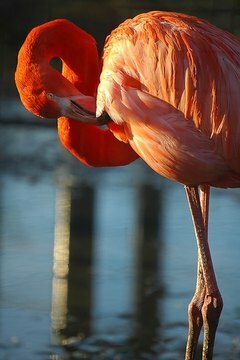 Flamingos also have specific movements for courtship and breeding. When they are ready to mate, they march and turn their heads. They also call out to one another and preen themselves to get ready for breeding. Some observers say the flamingos' movements during courtship and breeding almost look like dancing. Pink flamingos eat many things they filter out of the water, including diatoms, seeds, blue-green algae, crustaceans, fly larvae and mollusks. To find their food, they move through the water stomping their partially webbed feet on the muddy bottom of the lake or lagoon. This stirs up particles and mixes the flamingos' food with the water. They then use their heads--upside down, moving side to side--and take the food out with their giant beaks. Sometimes, flamingos bury their entire heads into water to collect food. Their beaks have filters to remove it. Flamingos live, move and feed in groups called colonies. Tens of thousands of flamingos can live in a single colony. Since they move, breed, and feed in numbers, this helps them stay safe from predators. While some flamingos' heads are buried in the water and mud looking for food, others can watch for any predators, using their long necks to stretch and look around. They swim or fly to get away from the predators when they are warned by honking from other members of the colony.